After a good night’s sleep, waking up refreshed is one of the best feelings you can ask for. Your body feels rested, your mind is sharp and your muscles are…tight! Spending 10 to 15 minutes stretching each morning is effective at helping you wake up, loosens your muscles for the day ahead and is considered a form of exercise. A.M. stretching is also helpful for improving your posture. How? If you’re one of the millions of people worldwide that works behind a desk, slumping toward a computer and excessive sitting can result in tight chest muscles and an overstretched back. Implementing morning stretching into your daily routine isn’t just effective for loosening tight muscles, but helps them to become more flexible. Overtime, you’ll notice a positive change in your posture. Improving and maintaining your health is our goal. If you haven’t seen us in a while, schedule an appointment today. Sitting is the new smoking, which is why getting up and moving is more important than ever. But if you don’t have time for the gym, don’t worry. Fitting in the recommended 10,000 steps a day isn’t only doable, but can be fun as well by using a simple pedometer or fitness tracker to monitor your steps. Incorporating movement into your workday can be as easy as taking the stairs instead of the elevator and walking during phone calls. Divide your workday with a quick stroll during your morning and afternoon breaks. Have a pet waiting for you at home? Ending your day with a breath of fresh air outside and a lap around the block won’t just please your furry friend—it’s good for your body, too. Regular chiropractic care can also help you stay active by keeping your spine healthy! Give us a call to schedule your appointment. 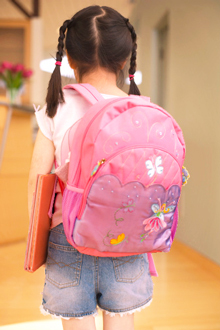 Each year hospitals treat thousands of children suffering from backpack-related injuries. Many of these result from carrying too much weight. Is your child using a backpack that is incorrectly sized? Is it configured properly? Are the shoulder straps adjustable? Are there interior compartments to hold items in place? Is the backpack the right size for my child? If the answer is “yes” to each question, you may have found the perfect backpack. Go a step further and teach your child how to properly pack them by positioning contents for little movement and making sure the entire pack weighs less than 10% of their body weight. Wondering what else you can do? Feel free to schedule an appointment at our practice for a quick loaded backpack evaluation with your child.